Is Prineville on the mend? With unemployment hovering at 19 percent the county has its challenges. But there are good signs. A railway artery that first brought economic lifeblood to the heart of Crook County has been revitalized as a modern day engine of growth through the evolution of Prineville Freight Depot, which recently announced the addition of another major anchor tenant. The new transportation hub has garnered wide attention since its inception in 2005 and major expansion last year. The latest coup is the the landing of EnviroTech Services, Inc. (ESI) which has established a state-of-the-art base for formulation and distribution of its road maintenance and safety solution products. Facebook recently revealed that it hopes to double the size of its first company-built data center, which is set for completion early next year at a price tag of some $180 million and currently employs between 150 and 200 construction workers. The data center’s first phase will also create 35 permanent jobs. On the small manufacturing side one can only look to Prineville’s roots with the Man Saver, a revolutionary tool being made in Powell Butte that makes driving posts a safe, affordable and easy one-person job. Forever Country is an apt tagline used by the local Chamber of Commerce to describe the independent-minded community of Prineville, evoking not only pioneering cowboy roots but also wide open vistas and new frontiers of economic opportunity – brought right up to date with the recent arrival of social media powerhouse Facebook. The Crook County seat at the geographic heart of the state is the oldest incorporated town in Central Oregon and has managed to artfully blend the traditional and contemporary. 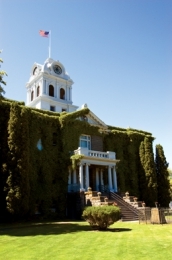 With a surrounding area rich in rangelands, forests and irrigated agricultural fields, this historically predominantly ranching and farming community still has an Old West atmosphere – which is enhanced by the presence of the historic circa 1909 Crook County Courthouse – and is known for a strong identity; leaders with the town’s interests at heart and residents that are heavily engaged in civic activities. Rodeos, the county fair, and outdoor recreation are very popular pursuits and the town is the gateway to the Ochoco National Forest, Painted Hills National Monument, and a host of lakes and reservoirs popular with boaters and fishermen. But while Prineville’s origins are tied to the land in agriculture, forest products, the railroad, and manufacturing, community leaders recognize the effects of industry fluctuations on employment and are united in their efforts to grow and diversify the economic base, in a concerted move to assure long-term vitality through the creation of family-wage jobs. The first settlers in what was to become Crook County came to the “Oh-cho-coe,” a Paiute word meaning “willows.” In 1882, the county separated from Wasco County, and was named for General George Crook, a recognized Native American fighter. Prineville was founded when Barney Prine settled on the banks of the Crooked River in 1868. The town was originally called Prine, but in 1872, its name was officially changed to Prineville. Although Prine operated a blacksmith shop, saloon, and store in the fledgling town, the development of the community is generally credited to the efforts of Monroe Hodges, who arrived there in 1871 and constructed the town’s first hotel. Hodges had the townsite surveyed and platted by 1877, allowing for the organized sale of property to newcomers. In 1880, Prineville became one of the state’s first incorporated cities, and obtained its first high school in 1902, and, to this day, it remains Crook County’s sole incorporated community. Long the major town in Central Oregon, Prineville was snubbed in 1911 when the railroad tycoons James J. Hill and Edward H. Harriman bypassed the city as they laid track south from The Dalles. In a period when the presence of a railroad meant the difference between prosperity and a potential fate as a ghost town, in a 1917 election, Prineville residents voted 355 to 1 to build their own railway, and raised the money to connect their town to the main line 19 miles (31 km) away. Helped by timber harvests from the nearby Ochoco National Forest, the City of Prineville Railroad prospered for decades. The profits from the railroad were so abundant that between 1964 and 1968, the city levied no property taxes. However, with the decline of the timber industry in Oregon, the railroad reported a loss of nearly $1 million between 2002-04, before gaining a new lease on life through the collective efforts of civic leaders and the formation of the Prineville Freight Depot (see companion story) which has thrived in its bid to become a regional transportation and storage hub with the help of state and federal funding. Prineville is known for its well trained workforce, with much of the jobs attributed to secondary wood-products and distribution through firms such as Les Schwab Tire Company, which has retained a large retread and warehousing/distribution presence despite moving its administrative headquarters to Bend. The town also has a high concentration of trucking/ground transport companies with its centralized location and several local firms that provide excellent service and rates for transport to and from major markets. Outside the manufacturing and distribution sectors, agriculture still plays an important economic and cultural role, with ag commodity sales of some $42 million, while new destination resorts such as Brasada Ranch offer another form of tourism and revenue for the county. New residents continue to be attracted to the small town charm, and newer planned communities such as Ironhorse and Ochoco Pointe have expanded residential choices. Another attractive aspect of doing business in Prineville is the low cost and abundance of industrial lands, spanning over 2,000 acres, much of it ready for development – which is one reason, together with Enterprise Zone incentives and abundant infrastructure, that Facebook chose the area for its first wholly-owned data center earlier this year. Prineville’s population growth has also been the highest in the state in recent years, increasing by an impressive rate of 38.5 percent from 2000-2007. Much of that growth is attributed to the small town, rural feel of Crook County, recreational opportunities, relatively mild climate, and more affordable housing compared with other Central Oregon communities. Prineville-Crook County Chamber of Commerce Chief Executive Officer Bill Gowen said: “Our slogan is ‘Forever Country’ and that embodies a number of meanings, not just the cowboy and agricultural heritage, but also symbolic of our open space and unlimited opportunities. “We don’t suffer defeat and are moving forward in a planned direction. This town is durable and this community, of which I am proud to be a part, has the ability to think on its feet and progress with great energy and a can-do spirit. “We are heading in innovative directions, such as with initiatives like the Freight Depot transportation hub and the recently upgraded Prineville Airport. “We also have ample ‘shovel ready’ land and economic incentives which companies like Facebook – which is employing many local contractors in its construction and promises to offer further spin-off business – have responded to, aided by a strong economic development team encompassing everyone from the local to regional level, including bodies such as the City, Chamber and EDCO. “Also, we have Pioneer Memorial Hospital driving a major expansion to enhance our medical service scope and a wonderful new educational facility to be built adjacent to the county fairgrounds in the form of the Oregon Open Campus project.